I’m going to be honest, I have yet to try this one, but my Mom makes it all the time and thought I should share it with you all. It is one of my brother’s favorite recipes too. In fact he was at her house when she made it and she had him send me a few pictures. When I have some holiday ham leftovers I will definitely give it a try. It’s easy enough and if your family isn’t into cream of mushroom soup, I bet you can swap it out with cream of chicken or celery too. Also, if you can’t find canned asparagus, you can blanch some fresh pieces. Or if you don’t like asparagus, use peas - canned or frozen would work. There are so many possibilities here. Thanks for sharing Mom! Enjoy! Preheat the oven to 350 degrees. 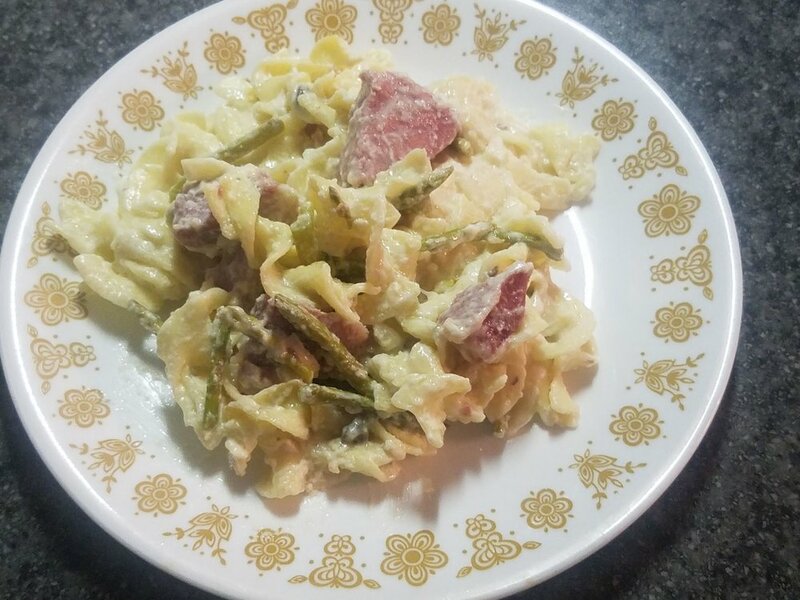 In a large bowl combine the noodles, ham, asparagus, and cheese. In another bowl combine the soup, milk, and sour cream. Add it to the noodle mixture and stir to combine. Grease a large casserole pan or Dutch oven and place the mixture into the pan. Bake covered for 1 hour.